When temperatures fall, help keep your feet and legs protected in these Heat Holders thermal socks in an extra long length. With a massive tog rating of 2.34 these mens thermal socks are fully cushioned and seriously thick. In a knee high length for great, warm coverage, these socks have been made with a heavy bulk yarn that was specifically blended for its extreme thermal qualities. The inside of each sock has been intensively brushed ensuring warm air is trapped close to the skin keeping feet warmer for longer, plus creating a incredibly soft feel. 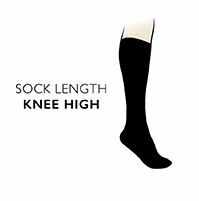 This extra long Heat Holder sock in a knee high length is the ideal sock choice if you work outdoors in colder conditions.